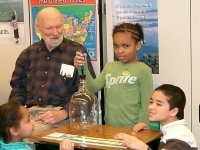 Volunteer Sam Wolfe works with Fairfax science students. The gym at Fairfax Elementary School buzzed with excitement on picture day. Mrs. Schmidt’s third graders lined up and took their places on the risers. Last to step into the picture was octogenarian Sam Wolfe, the oldest member of the class, a volunteer for six years. After retiring from 30 years of teaching science at West Technical High School in Cleveland, he had time to use his ham radio, manage an electronics stockroom at Case Western Reserve University, and complete an eight-month walk across the United States to promote global disarmament. Fairfax physical education teacher Alice Stratton met Sam at the Ohio City Bicycle Coop and recruited him as a volunteer. Three years ago he began sharing his Community Garden plot with the class. It is one of many spectacular gardens located on school property and is visible from Lee Road. On a recent fall morning, Mr. Wolfe took a few minutes to show the class a plant from his garden. As students watched intently, he crushed some berries and made a purple ink from the juice. Mrs. Stratton and Mrs. Schmidt developed hands-on science lessons around the garden. In the classroom, students tested seeds for germination and planted the ones with the highest germination rate in the garden. When they harvested the early maturing radishes and lettuces, Mr. Wolfe and the students celebrated with a harvest party.